If you visit Japan in spring, make sure you enjoy the wonderful sight of the sakura (cherry blossoms). This article introduces the cherry blossom forecast for 2019 and the best 44 cherry blossom viewing spots around the country! 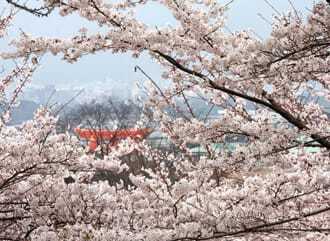 The number of visitors to Japan from abroad spikes in spring, especially in April as many people come to view the cherry blossoms (sakura), which bloom freely all over the country. The cherry tree is a deciduous tree in the rose family, which has spread out in the temperate zone of the northern hemisphere, in places such as East Asia, Europe and the North American continent. Pink and white flowers bloom in spring, and they are mostly planted for decoration purposes. Cherry blossoms have been regarded as a symbol of spring since the Heian era (794 - 1185), and this has been woven into the cultural consciousness of Japan. They bloom in April, which is considered to be the beginning of a new year in Japan in regards to business and academics. 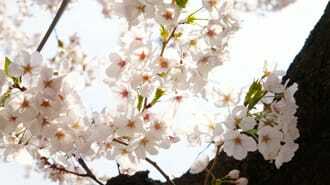 Cherry blossoms are also a symbol of a new start, such as graduation, entering a new school or starting new employment. They are truly special flowers for the Japanese. In the language of flowers, cherry blossoms are said to represent innocence and the spirit of beauty, as they bloom quickly, live for a short time, then quickly fall away. This transience is part of their appeal. Furthermore, the graciousness that this life cycle represents is also seen as being symbolic of the bushido or warrior spirit in Japan. Currently, there are more than 600 types of sakura in Japan, but the Somei-Yoshino, which spread after the Meiji Period (1868 - 1912), is the most abundant. It's actually quite fun to travel around Japan and check out the differences between the various types of cherry blossoms. 9. What Is Cherry Blossom Viewing (Hanami)? The sakura trees bloom in spring, but their cycles differ in each area. The list below shows the blooming dates of major areas, in an average year. The date changes every year, so if you are planning a visit, be sure to check the latest information in advance. Meguro River is located near Nakameguro Station, which is two stops away from Shibuya Station on the Tokyu Toyoko Line. It is a prominent viewing spot in the Tokyo Metropolitan area. The river is 8 kilometers long, running through Setagaya, Meguro and Shinagawa wards, and in the spring, 800 trees bloom on the riverside along 4 kilometers. The chic area surrounding the Nakameguro Station is home to many cozy cafes, restaurants and shops. It is also one of the most popular and sought-after areas for people to live in. In spring, visitors can spend all day in this area, as they can enjoy viewing the cherry blossoms, dine, shop and also enjoy the yozakura (night view of the illuminated sakura). Shinkansen lines, JR Lines and subway lines - all run through Ueno Station. From the station, it is a three minute walk to the Ueno Imperial Park, an expansive park also known as Ueno Park. The park has been famous as a cherry blossom viewing spot from the Edo Period (1603 -1868), and people enjoying a picnic under the cherry blossoms, with the ubiquitous blue tarpaulins covering the ground, have become a common sight in spring. The park is illuminated at night, and the visitors can enjoy nighttime sakura. Public lavatories are located in the park too, so there is no need to worry. There are several museums, a zoo, and cafes in this park, making it a great place to spend a pleasant day out in the city. Shinjuku Gyoen is a large garden, originally built for the Imperial Family. Visitors can enjoy three different types of gardens: the French Garden, with its beautiful tree-lined avenues, the English Landscape Garden, which has a spacious lawn, and the traditional Japanese-style Garden. 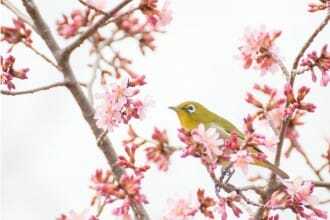 There are 65 types of cherry blossoms, about 1100 trees in all, planted in the garden, and it might be fun to try and find out the differences between them. Sakura manju (buns with sweet filling), sakura konpeito (pointed sugar candy ball, scheduled for sale in March) and sakura dorayaki (pancakes with filling) are sold at the stands in the garden. Bringing alcoholic beverages into the garden is prohibited, so if you want to enjoy a quiet atmosphere, this is the perfect spot. Asakusa is popular with visitors from abroad as an area where traditional Japanese scenery is still preserved, while Sumida River and Sumida Park, located nearby, are both known as riverside viewing spots. The cherry blossoms along the Sumida River can be enjoyed by just walking along the riverside, or by looking up from a yakatabune (roofed boat with tatami floors). 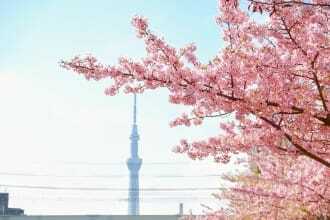 Tokyo Skytree is also nearby, so visitors can enjoy the view of both the sakura and the tower. Mohri Garden is a surprisingly large, charming Japanese garden, located among the commercial facilities of Roppongi Hills. Located in the middle of an urban area, the park has a soothing effect on the visitors, becoming popular as a relaxation spot for shoppers and restaurant patrons. The scenery here changes every season, and visitors can enjoy the autumn leaves as well as the cherry blossoms. Sakurazaka, located in Den-en-chofu, an upscale residential area in Tokyo, is a viewing spot where you can enjoy a tunnel created by the cherry blossoms. "Sakurazaka" is also a title of a song by the popular Japanese singer, Masaharu Fukuyama. Many people come to visit the place which inspired the song, throughout the year. "Sakurazaka" is a love song, so couples going out on a date often stop to take photographs at Sakurabashi Bridge, located at the top of Sakurazaka. As this viewing spot is located in a residential area, be sure to keep your voice down. 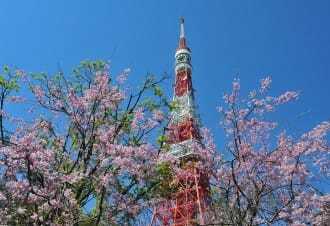 For more information about the sakura viewing spots in the Tokyo metropolitan area, please take a look at the following article too. Sankeien is an immense Japanese garden located in Yokohama, in Kanagawa prefecture. It was a place to support artists, and the year 2016 marks its 110th anniversary. In spring, the 300 sakura trees blend into the beautiful Japanese landscape. The historic buildings relocated from Kyoto and Kamakura to this garden are also worth a look. The Izu area in Shizuoka Prefecture is known as one of the prominent hot springs areas in Japan. Kawazu is especially known as a sakura viewing spot, as well as for hosting the Kawazu Cherry Blossom Festival. During the festival, there are places to view the cherry blossoms while enjoying an ashiyu (foot bath), and yozakura as well. Visitors can enjoy the different atmospheres of day and night. Kawazu Sakura Festival - View The Cherry Blossoms Early! 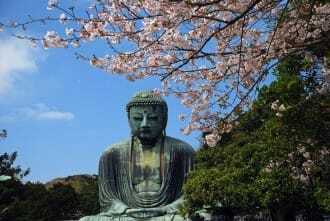 Kamakura, once the capital of Japan, has become famous as a sightseeing spot in Kanagawa prefecture, with its natural environment and various shrines and temples. Tsurugaoka Hachimangu Shrine is a major sightseeing spot, where the visitors can enjoy the cherry blossoms blending into the scenery full of historic buildings. The trees are lined up on both sides of the dan-kazura (raised approach to the shrine). Visitors can enjoy strolling around the various souvenir shops and restaurants in the surrounding areas while enjoying the view as well. Kawaguchiko (Lake Kawaguchi) in Yamanashi Prefecture is located at the foot of Mt. Fuji. It takes about two hours by car or train to reach this area, where visitors can enjoy spectacular views every season, including that of the cherry blossoms in spring. Many people visit the lakeside Nagasaki Park, to view the sakura against the backdrop of Mt. Fuji. The altitude of this area is higher than Tokyo's, meaning that the sakura typically bloom in late April. Those who missed the cherry blossoms in Tokyo should definitely visit Kawaguchiko. The Arakurayama Sengen Park in Fujiyoshida City, located near Mt. 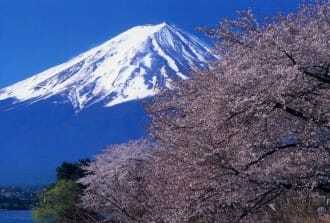 Fuji, is famous as a viewing spot boasting 650 sakura trees. It has become popular with visitors from abroad as a spot to enjoy the symbolic view of Mt. Fuji, along with the Chureito Pagoda. Mt. 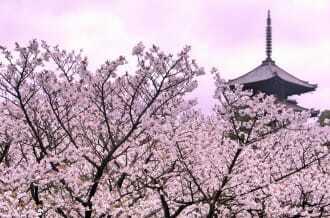 Fuji, the pagoda and sakura can all be viewed from the observatory, which is also the perfect spot to take photographs. Walking through the sakura tunnel is also very enjoyable. Maruyama Park is the oldest garden in Kyoto. It is a traditional Japanese garden, where visitors can enjoy the changing scenery every season. It is one of the prominent cherry blossoms viewing spots in Kyoto, and the illuminated shidare-zakura (weeping cherry tree) is also known as the Gion Yozakura. Daigoji, designated as a world heritage site, is a temple standing on a vast plot of land. The temple owns buildings and paintings designated as national treasures and welcomes a large number of visitors throughout the year. Daigoji has been known as a place to enjoy the cherry blossoms, where visitors can enjoy the flowers against the background of historic buildings. Arashiyama is an area located in the western area of Kyoto, known for its many traditional buildings, shrines and temples. There are about 1500 sakura trees in this area, where visitors can enjoy viewing the various types. The Togetsukyo Bridge, located near Arashiyama Station, is one of the prominent sakura viewing spots. This area is also famous for its bamboo thickets and the autumn leaves. Heian Jingu Shrine was built in 1895, to commemorate the 1100th anniversary of the capital relocation to Heiankyo (the city that later was to become Kyoto). The main shrine stands alongside a Japanese garden. It is also famous as a cherry blossom viewing spot, where visitors are greeted by the deep pink-colored flowers of a rare sakura named "yae-benishidare-zakura." In early April, the sakura trees are illuminated at night, and the visitors can also enjoy the nighttime cherry blossoms. Nara Park is a symbolic site in Nara city. Famous temples and shrines designated World Heritage, such as the Todaiji Temple, are located in its grounds. This park is also famous for being the home of many wild deers and squirrels. The small-sized sakura in the park are called 'nara-no-yaezakura'. In this park, visitors can enjoy both the cherry blossoms and the wild animals, which is the perfect way to experience the start of spring. 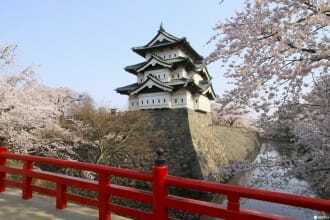 Koriyama Castle, located at Yamatokoriyama City in the northern area of Nara prefecture, is one of the best sakura viewing spots in the prefecture. 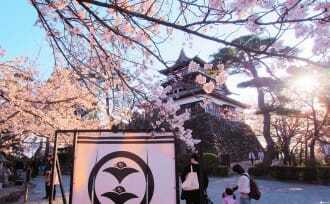 The castle was built in 1580, and has been famous as a cherry blossom viewing spot for more than 400 years. It is also known as the gotenzakura (sakura area of the palace), as there are more than 1000 sakura trees here. The Yamatokoriyama Castle Festival is held every year, from late March to early April. Okawa runs along the borders of Miyakojima and Kita wards in Osaka. The Kema-Sakuranomiya Park on the Miyakojima side and the Zohei-kyoku (Mint Bureau) on the Kita side, are both known as famous cherry blossom viewing spots. The Kema-Sakuranomiya Park stretches for 4.2 kilometers on both sides of Okawa. Buildings from the early Meiji period, such as the Zohei-kyoku and the Sempukan (former guesthouse of the Mint Bureau), are also located nearby. 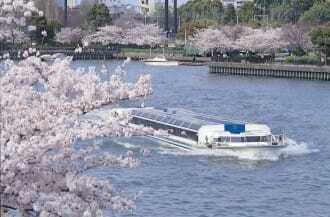 In spring, 4800 sakura trees bloom here, and visitors can enjoy the riverside scenery, as well as the cruise on the Okawa, well into the night. Osaka Castle, located in Osaka City, was built by Hideyoshi Toyotomi - one of Japan's prominent leaders during the Sengoku period, and renovated by shogun Ieyasu Tokugawa (1543 - 1616). It is regarded as one of the three best castles in Japan, and boasts an imposing figure. The Nishinomaru Garden, designated as an important cultural asset by Osaka city, is famous as a cherry blossom viewing spot with 300 sakura trees. 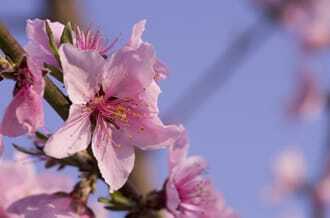 There is an ume (Japanese plum) grove as well, and visitors can enjoy a wide variety of flowers. For other viewing spots in the western Japan (Kansai), refer to the following article. Onomichi city is one of the popular sightseeing spots in Hiroshima Prefecture. Senkoji Par, located near the Seto Inland Sea, is a prominent sakura spot in Onomichi. The site rises about 100 meters from the sea, and the visitors can enjoy the view of the city, along with the islands. There are shrines, temples and historic monuments in Onomichi. It is also the entrance to the Shimanami Kaido, a highway connecting the islands in the Seto Inland Sea, which is also popular with cyclists. Visitors can use the ropeway to reach the top of the park. Ueno Park, located in Shobara city, Hiroshima prefecture, is a cherry blossom viewing spot situated around the Ueno Pond. In spring, sakura blooms around the two kilometer periphery of the pond, creating a colorful scenery. The Shobara-Ueno Cherry Blossoms Festival is held every year in April, and the nighttime view of the red bridge on the pond and the illuminations make the yozakura look even more beautiful. It takes about 90 minutes by car from Hiroshima city to Shobara, but if you are traveling to Hiroshima, it is worth a visit. Utsubuki Park, located in Kurayoshi city in Tottori prefecture, is a park built at the foot of Mt. Utsubuki, a local symbol. Diverse types of flowers bloom in spring, and many people visit this park to view the cherry blossoms. Mt. Utsubuki has been chosen as one of the 100 forests in Japan suited for Shinrin-yoku (a walk in the forest for therapeutic purposes), and has a serene atmosphere. 500 bonbori (*1) of various sizes illuminate the cherry blossoms in the nighttime, creating a fantastic view of the yozakura. *1 Bonbori: Illuminations with paper or silk shades. Tottori's Top 8 Cherry Blossom Spots - Mt. Daisen, Temples, And More! Hirakiyama Park, located in Imabari city in Ehime Prefecture, sits at 149 meters above sea level, on top of Mt. Hirakiyama. About 1000 sakura trees bloom here in the springtime. From the observatory in the park, visitors can see sightseeing spots such as Hakata Island, Ohshima Bridge, Omishima Bridge and the Tatara Bridge, along with the sakura. There is also a slide and a jungle gym, so the park is great for visiting with the family. Ritsurin Park, located in Takamatsu city in Kagawa prefecture, is a historic garden that was built in the Edo period (1603 -1868). The garden is a cultural asset, designated as the only "special place of scenic beauty" in the Shikoku region, by the Japanese Government. In 2009, the guidebook Le Guide Vert Japon awarded three stars to Ritsurin Park, and visitors from abroad have taken notice. In spring, 290 sakura trees bloom here, highlighting the six ponds and thirteen mounds laid out in the garden. There is a restaurant which serves Japanese-style lunch and also matcha tea, so you can spend an entire day in the garden. Kumamoto Castle, located in Kumamoto city, is a local symbol and acclaimed as one of the three best castles in Japan. It was built around 400 years ago, and the grand figure of the castle's black exterior is truly impressive. The sakura on the grounds bloom in spring, creating a wonderful contrast between the monotone castle and the pink flowers. The sakura trees are illuminated at night, so it is worth a visit at nighttime. Ohmura Park is a cherry blossom viewing spot located in Ohmura City, Nagasaki Prefecture. The park boasts 21 types of sakura, with 2100 trees in all. The Ohmura-zakura, designated by the Japanese government as a natural monument, is a rare type of cherry blossoms, with more petals than a ordinary sakura, and has the flamboyance of a rose. Most Japanese citizens have not seen it, so if you have the chance, make a visit to the park. Mifuneyama Rakuen (The Paradise of Mt. Mifune), located in Takeo, Saga Prefecture, is a grand park where visitors can enjoy the seasonal changes in the scenery. In spring, over 2000 sakura trees and 20,000 azaleas bloom, creating a dreamy, colorful landscape. During the Hanamatsuri (flower festival), which starts from late March, the sakura are illuminated in the nighttime. There are restaurants and tea houses in the park, so visitors can spend their time there leisurely. Saitobaru Kofungun (burial mounds), located in Saito, Miyazaki Prefecture, is a park built among historic remains. Sakura and colza bloom in spring, and the cosmos flowers bloom in autumn. At Goryohakamae, located inside the cluster of burial mounds, 2000 sakura trees and 300,000 colzas welcome the visitors. 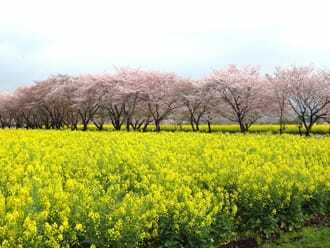 The vivid contrast between the pink cherry blossoms and the yellow colza catches the eyes of the visitors. Maizuru Park, located in Fukuoka city, is a park built on the former site of Fukuoka Castle. 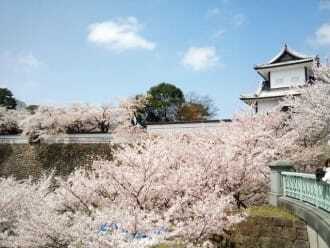 The castle has a history of 400 years, and turns into a cherry blossom viewing spot in spring. The "Fukuoka Castle Sakura Matsuri" is held during the cherry blossom season, along with various events, such as the illuminations in the nighttime and the open-air stalls lining up in the grounds. This is a place to enjoy the cherry blossoms in a festive mood. *Please note that the reproduction of the photograph above is prohibited. Koiwai Farm is located in the hills of Mt. Iwate in Iwate Prefecture. Visitors can enjoy the grand view of the mountain, along with the sight of the sheep roaming the pasture land. There is also a cow barn, along with other recreational facilities, so all visitors from children to adults can have fun here. The most impressive view at Koiwai Farm is the lone sakura tree standing nobly against the background of Mt. Iwate. The green pasture, Mt. Iwate and the single tree create a picturesque viewing spot. Kakunodate, located in Senboku City in Akita Prefecture, is an elegant historic town with rows of samurai houses. A part of the town is designated as a cultural asset by the Japanese government, and here is where visitors can enjoy the scenery surrounded by the mountains. 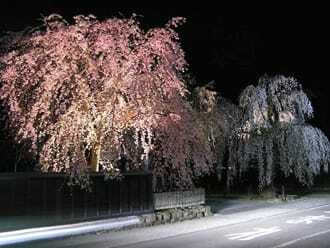 The famous 300 years-old weeping cherry trees of Kakunodate is illuminated at night. Matsugasaki Park, located in Yonezawa, Yamagata prefecture, is a park built on the former site of Yonezawa Castle. 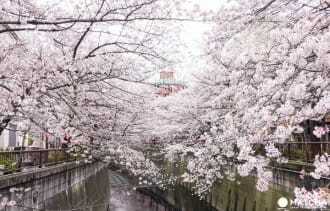 200 sakura trees surrounding the moat bloom in spring, attracting many visitors. 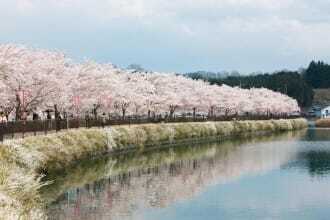 The reflection of the cherry blossoms on the moat surface, and the petals floating on it, is truly a sight to behold. There is a cherry blossom viewing spot called Natsui Senbonzakura (the Thousand Cherry Trees of Natsui) at Onomachi in Tamura, Fukushima Prefecture. About 1000 trees line up on both sides of the Natsui River for five kilometers. 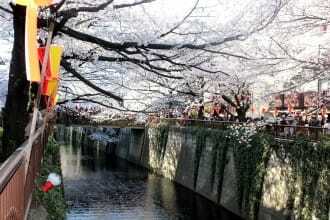 The visitors can also enjoy the koinobori (carp streamers), along with the sakura. The sakura bloom late in the Tohoku area, so the duet of a koinobori and cherry blossoms can only be seen in this area. Kancho-gai Dori (the public agencies district) is a sakura viewing spot located in Towada city, Aomori prefecture. In spring, 150 sakura trees bloom here, coloring the street in soft pink. 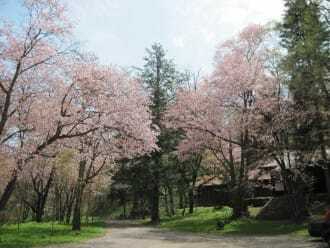 Here in Towada, visitors can enjoy the contrast created by the green pine trees and the pink cherry blossoms. After the full bloom, the streets will be the covered by the pink carpet of scattered petals. Nishi Park, located in Sendai, Miyagi Prefecture is a famous sakura viewing spot, where people enjoy drinks and food sitting on blue tarpaulins laid out on the ground. Although a reservation is required in advance, air-conditioned tents equipped with cushions are also available, making this park a popular cherry blossom viewing spot for Sendai citizens. Matsumae Park, located in Matsumae, southern Hokkaido, is a park built on the former site of Matsumae Castle. Matsumae is the only jokamachi (*2) in Hokkaido, and the park is regarded as a "sakura village," where 250 types, ten thousand sakura trees in all, bloom in springtime. The Matsumae Sakura Festival is held in the cherry blossom season, with attractions such as a musha (warrior) parades and dance performances. Each type of sakura blooms according to their own cycle, so the visitors can enjoy them for over a month. *2 Jokamachi: A town which developed around a castle, with remnants such as stone walls and moats. Shizunai Nijukken Road, located in the Hidaka county, Hokkaido, is an cherry blossom viewing spot stretching along a straight road. The sakura trees, transplanted from the nearby mountains, spread out for about seven kilometers. Shizunai Nijukken Road has been chosen as a Hokkaido Heritage site, a collection of various assets to be preserved for the following generations. It has become a prominent viewing spot in Japan, where a total of 200,000 visitors come to enjoy the rows of cherry trees in early May. Goryokaku Tower is an observatory located in Hakodate City in Hokkaido. From the tower, visitors can view the star-shaped Goryokaku Park. The park is a well-known viewing spot, where 1600 sakura trees bloom in spring. At that time, the view from above has an appeal of its own, as it shows the landscape painted in pink. Visitors can enjoy it from the tower, which has a transparent floor equipped with reinforced glass. The facility has a restaurant and a cafe as well, so the visitors can take their time and enjoy the scenery. Moerenuma Park is a large park located in Sapporo, Hokkaido, which was designed by the renowned sculptor Isamu Noguchi. The design is unique, with geometric-shaped mountains, fountains and playground equipment laid out all over the park. The Sakura Forest, where 2300 sakura trees bloom in spring, is the cherry blossom viewing spot. In this park, visitors can enjoy the harmony of nature and art. Takada Park is a cherry blossom viewing spot located in Joetsu, Niigata Prefecture. Takada Castle was built in the Edo Period, and Takada Park is built on its former site. Visitors can observe the remnants of the town that flourished around the castle in this park. Takada Park is listed among the three best places in Japan to view the yozakura, as the whole park, including the row of sakura trees named Sakura Road, is beautifully illuminated at night. This is a spot worth visiting at night. Takato Joshi Park in Nagano Prefecture is built on the former site of the Takato Castle. 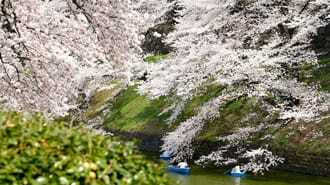 It is also famous as a cherry blossom viewing spot and listed among the best three viewing spots in Japan. The local sakura, called Takato kohigan-zakura, is a small type of sakura with a reddish flower. The cute flower has been claimed as the best in the world, and the trees in the park are designated as natural monuments by Nagano Prefecture. This type of sakura can be appreciated only at Takato Joshi Park. Matsumoto Castle in Nagano Prefecture is designated as a national treasure. It is also one of the prominent castles with the castle tower still intact. It is called 'Kurosagi (black reef heron) castle', due to its black exterior. In spring, many people visit this castle to enjoy the cherry blossoms. There are 300 sakura trees planted in the site, and this view against the backdrop of the black castle is especially popular with visitors. The cherry blossoms are illuminated in the nighttime, so that is another appeal of this spot. Kenrokuen, located in Kanazawa, Ishikawa Prefecture, is one of the best Japanese gardens built in the Edo Period. It is ranked among the three best Japanese gardens in the country and is where over 400 sakura trees are planted. There are many old sakura trees of historical interest in the garden, and a rare type of sakura named Kenrokuen Kikuzakura can only be seen in this garden. 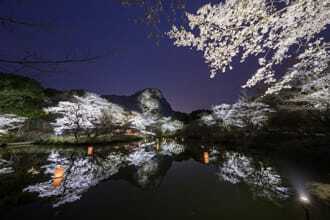 In early April, the sakura trees will be illuminated at nighttime, and Kenrokuen will be opened to the public for free. Nagoya Castle, located in Nagoya, Aichi Prefecture, was built in the Edo Period, and is regarded as one of the three best castles in Japan. The golden shachihoko (a fabled fish with a lion-like head) figure on top of the castle tower has become the symbol of Nagoya. There are one thousand sakura trees at Nagoya Castle, and the sight of the cherry blossoms and the castle tower is especially breathtaking. 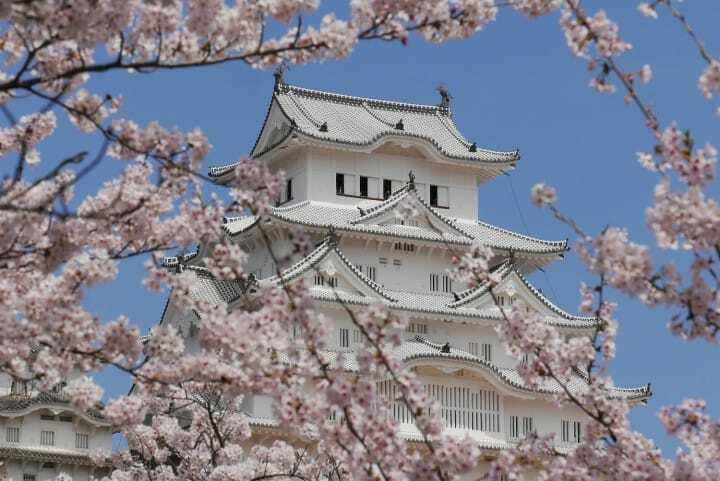 Visitors can enjoy the various views of the cherry blossoms and the castle at this site. What Is Cherry Blossom Viewing (Hanami)? In Japan, there is an event called hanami or ‘cherry blossom viewing party’ in spring, in which people enjoy the sakura in full bloom. This section is about its history and the manners one should heed at hanami parties. Hanami are said to have started in the Heian era, when aristocrats would gather together under the sakura and write poems. There is also an account of a hanami party in The Tale of Genji, the oldest novel written in Japan, describing it as a custom among the nobility. Cherry blossom viewing parties became popular among the common people over the years. Now, it is seen as an opportunity to have a picnic while viewing the flowers. Take a look at Hanami - How To Enjoy Cherry Blossom Viewing for more. The general idea of hanami is to find a place where you can view the cherry blossoms, cover the ground with a tarpaulin sheet and sit down to view the flowers. Bring your own food and drinks, along with paper cups and saucers, and enjoy a picnic under the flowers. Our article 15 Items To Make Your Hanami Great! has more about the things you should prepare for a hanami party, so take a look. 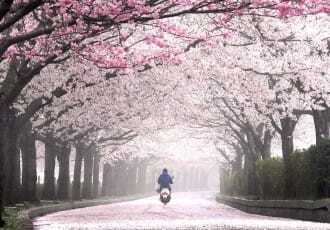 Many people come to view the beautiful sakura, and the proper manners of hanami have become an issue. The following are some points to watch out for. At cherry blossom viewing parties, people enjoy dining with their friends and families in public parks and the like. The amount of trash will grow with the number of participants, but leaving your trash behind or just throwing it away is out of the question. Trash boxes are set up at the major viewing spots, so be sure to use them. The trash should be sorted out in categories, such as burnable waste, non-burnable garbage, and recycling items, like plastic, cans, and bottles. Our article Clean Up The Right Way: Dealing With Trash After A Hanami will tell you more on how to handle the trash. At hanami parties, people can enjoy the cherry blossoms at arm's length. Some break off a branch to take back home, or rustle the tree to make the petals fall. Sakura are delicate plants and such acts may make them wither or not capable of blooming in the future. When you go to a hanami party, don't touch the trees, and just enjoy the view. The short period of time when the sakura are in bloom is a truly special season in Japan. The locals are celebrating the joy of seeing the beautiful cherry blossoms in all possible ways. Taking part in hanami parties is one of them. Enjoying sakura flavored sweets and drinks is another way of celebrating the arrival of spring. In fact, you will notice that the foods and drinks served at hanami parties are decorated with sakura. At every supermarket, you will find chocolate, sweets and drinks with sakura flavor. They are all available only for a limited period of time, so do give them a try if you have the chance! One of the traditional sweets specific to this season which you simply have to try out is sakura mochi - a cake made with sweet mochi rice and a red bean paste filling, wrapped in a pickled sakura leaf. The unique combination of the sweets taste of the filling and the salty-sour taste of the leaf will leave a deep impression on you. This is a sweet that has been loved in Japan for centuries. There are even regional variations, and we recommend trying out both the Kanto and Kansai versions. As far as the drinks go, for a limited period of time, the shelves of the convenience stores and supermarkets will be carrying sakura flavored or sakura inspired drinks. There is a great variety of delicious, non-alcoholic beverages, so even if you don't drink alcohol you can join the party and enjoy the taste of the season! The spring blossom tea or sakura flavored latte drinks are some of the beverages that we warmly recommend. What's more, at restaurants such as Ginza Sushi Ojima or Akasaka Kinryu, which specialize in kaiseki cuisine (Japan's refined traditional cuisine) you will be able to taste sophisticated dishes decorated with cherry blossoms or with sakura inspired motifs. Dishes cooked with high-quality sakura shrimp enjoy the peak of their popularity during the season of the cherry blossoms. We recommend making the most of this unique season by enjoying dishes, sweets and drinks that are connected to or inspired by the cherry blossoms. Enjoy the Cherry Blossom Season in Japan! Cherry blossoms are a special spring feature, an embodiment of something Japanese that cannot be described in a single word. If you happen to visit Japan during the spring, use this article as a guide, and enjoy viewing the beautiful cherry blossoms.